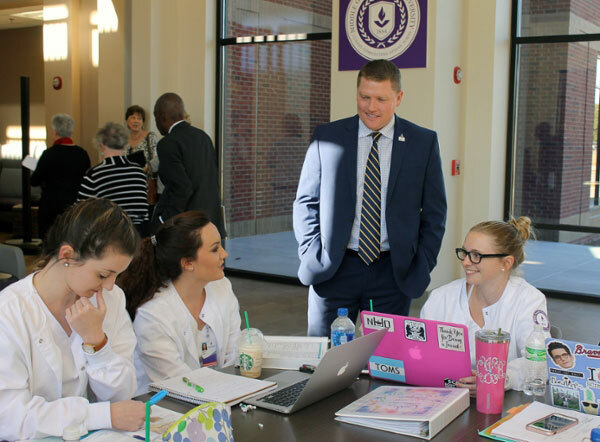 Dr. Jonathan R. Anderson, MGA's new provost and vice president for Academic Affairs, visits with nursing students at the grand opening of Oak Hall's STEM wing on the Warner Robins Campus. In January 2018, Dr. Jonathan R. Anderson became provost and vice president for Academic Affairs at Middle Georgia State University. The provost is the University's chief academic officer and serves as the chief executive in the absence of the president. Anderson began his professional life in the financial services industry, working as a liability specialist in his home state of Utah before taking loan officer positions in the Atlanta area. He moved into education in 1999, becoming a business teacher and coach at Bremen High School in Bremen, Ga. He holds a Ph.D. in Business Administration: Management from the University of Kentucky, a master's in Business Education from what is now the University of West Georgia, and a bachelor's degree in Sociology from Utah State University. After earning his Ph.D., Anderson joined the faculty of the University of West Georgia. In nearly 15 years of experience at the Carrollton-based University, Anderson served as associate dean and MBA director, assurance of learning coordinator for GeorgiaWebMBA, Southern Association of Colleges and Schools Commission on Colleges accreditation liaison, associate vice president for Academic Affairs, and deputy provost. In this Q&A, Anderson talks about what led him into higher education, his early impressions of Middle Georgia State, and his goals for helping the University move forward. Have you always wanted a career in higher education? What brought you into the profession? "I have always been interested in learning and teaching. While I was an undergraduate student, I had the chance to work closely with a few professors and administrators that helped shape my future plans. I was fortunate to grow up in an environment that valued education. Not being sure where I would end up working, I knew from a young age I wanted to end up somewhere in education. I have taught middle and high school, coached sports at both levels, served as a professor and now enjoy administration. Higher education administration is rarely a job you aspire to as there is such a long road to get there, but it has been a great fit for me and I have learned a lot along the path." What attracted you to the provost's job at Middle Georgia State? "I believe Middle Georgia State is positioned to be the next great success story in the state. As such, when this position opened, I was very interested. During the interview process it became clear that the institution had some challenges, but that there were good people embedded throughout the five campuses and that the institution was willing to grow and change. That willingness to change is not found in many institutions. President Blake has led an effort to position the institution for growth. I feel fortunate to be here at this point in the institution's history. It seems clear that the foundation is built for us to grow and move forward. I am grateful to be a part of MGA's future." What are your thoughts on the potential that Middle Georgia State has that hasn't quite been realized? "As an institution with a blended mission, MGA serves a broad range of students. Some are well prepared for university study, others still need some assistance in their preparation. Some consider this to be a great challenge. I believe it gives MGA great potential that it has not yet realized. MGA has the opportunity to serve students from a variety of backgrounds and if MGA creates the right mix of programs and practices, we can help educate the next generation of people who will choose higher education in Middle Georgia and stay here to help the region's economy grow. The potential to impact the economy and society in Middle Georgia is the hidden gem that MGA needs to find and I believe we are starting to uncover it." What are your short-term goals as provost? What are some of your longer term goals for MGA? "The first few months in the Office of the Provost have been very busy. Much of the effort has focused on organizing our work and helping find people's passions and providing opportunities for individuals to use their skills to help MGA develop. In the short-term, organizing the work in academic affairs will take some time. We need to make sure that we offer the right courses, at the right times and locations. This is a challenging part of the work we have. Making strategic decisions about which programs to offer on what campuses is also an effort because every decision has positive and negative outcomes. So, in the short-term, making sure we are focusing people's passions and interests in ways that help the University move forward and organizing the offering of programs and courses on each campus will be the priorities. "In the long run, MGA will only become more successful when it graduates individuals who go on to add value to the societies in which they live. Keeping a vigilant focus on the recruitment, retention, progression, and graduation of students will be the benchmark by which MGA's long-term success will be measured. MGA must make sure that it keeps student success as the focus and that other interests don't distract resources from that effort." What is the most important message you would like to convey to the region about Middle Georgia State? "Middle Georgia State is the region's state university and should attract the best and the brightest students from across the region. It should also attract students who need help in succeeding. As this blended mission is implemented, the region should know that our primary focus is to meet the higher education needs in Middle Georgia. MGA is here as a partner in economic development, educational attainment, and social progress. MGA is a great resource for the region and we need to continue to find ways to build partnerships in our effort to play a role in growing and developing Middle Georgia." What are some of your impressions as you've gotten to know the communities MGA serves? "The communities in Middle Georgia are filled with quality, educated people who care about the future of this region. Everywhere I have been I have had the chance to meet people who are passionate about their community and want the next generation to live a little better than they did. It is our opportunity to play a role in that future." "I'm 44 years old, originally from Utah. I met my wife, Kristyn Anderson, in Idaho, but she grew up in Georgia, in Cobb County. We've been married for 21 years and have seven children, ranging in age from 20 to 3. I had lived for a time in Tennessee and my wife and I decided to raise our children in the South. Georgia has been a great fit for our family. "In my spare time, I really enjoy building things and doing woodwork. I like to learn how things work and make them work better. I also enjoy doing anything outside - running, hiking, biking, walking, water skiing, wake boarding, etc." What are some things people would be surprised to learn about you? "I ran a marathon in 2009. I have two sons who served as missionaries, one in Brazil and the other in Portugal." "It's one from Steve Jobs: 'Your work is going to fill a large part of your life, and the only way to be truly satisfied is to do what you believe is great work. And the only way to do great work is to love what you do. If you haven't found it yet, keep looking. Don't settle. As with all matters of the heart, you'll know when you find it.'" Editor's note: This Q&A originally appeared in the spring 2018 issue of MGA Today magazine.